Our Justices courageously interpreted the constitution with a blind eye towards justice. They chose right over easy. The Vermont Supreme Court issued a monumental decision of seismic proportion a couple weeks ago in Zullo vs. the State of Vermont. As legal scholars grapple with the ramifications of Article 11, monetary damages and search and seizure, the Attorney General is still muddling through this voluminous decision. The decision rambles on about reasonable suspicion resulting in the smell of “a faint odor of burnt marijuana”, the idea of Article 11 being “self executing” (enabling Gregory to file suite against the state), “bad faith” and “unlawful animus”. The one that thing can be said of this historic decision is that it is complicated and even befuddling legal experts. With all this to unpack it is probably fair to say that this State decision is comparable to Brown vs. the Board of Education at a national level. This finding taught us that search and seizure protection in Vermont is greater than those offered by the US Constitution. Our Justices courageously interpreted the constitution with a blind eye towards justice. They chose right over easy. Interestingly what lies at the center of this case is a black man, drugs (suspicion) and a law enforcement officer. This case started with yet another traffic stop, and though seemingly absent use of force, the force exerted caused traumatic impact. Gregory was one of the fortunate few. He was able to negotiate the maze of confusion and find remedy. Make no mistake about it; there is nothing normal or trivial about his endeavor. It was a miracle, thanks to the Vermont ACLU a private law firm and a number of friends of the court through an amicus brief. Thousands of cases never see the inside of a courtroom. Black and brown people in Vermont faced with lost civil liberties are often left traumatized and paralyzed. Now is the time for the legislature to take action. The legislature should take up the bill expanding the Human Rights Commission with the addition of a litigator, a community outreach director and funding to enable Community Justice Center intake. This bill calls for Vermont to join the 30 states that have made racial profiling illegal. The legislature must also conduct public hearings to determine the progress of the implementation of the work that has been accomplished in Act 9 (2018), Racial Equity Panel (and Director) and Act 54 (2017), Racal Disparities In the Criminal and Juvenile Justice System Advisory Panel. Finally, when discussions on regulation and legalization of marijuana arise (as is inevitable), hopefully we won’t forget the story of the black man, law enforcement officer and drugs. There should be no regulation or taxation of marijuana without addressing the harm of the past and providing a hope for the future for black and brown people. The moral arc of the universe is indeed long and bends toward justice in Vermont. 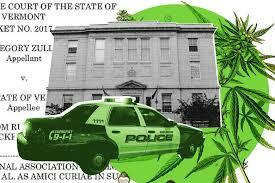 Let the battle against the war on drugs continue in the Green Mountain State.